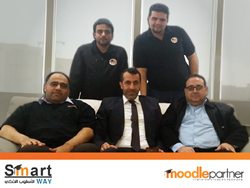 SmartWay deliver Moodle eLearning solutions across much of the Middle East, specializing in delivering e-learning projects and services to government, academic institutions and corporate organisations. Moodle, the world’s open source learning platform, today announces SmartWay as a Moodle Partner across wider geographic areas in the Middle East. SmartWay provides elearning services and training to provide online educational environments ranging from global enterprises, government, and education to mid-sized and small businesses. Broadening the Moodle Partnership across all their regional offices, Smartway can provide official Moodle services to customers, while helping to financially support core Moodle development. Smartway have officially been named certified Moodle Partners in Saudi Arabia, Iraq, Syria, Oman, Morocco, Turkey, Lebanon and United Arab Emirates. Already well established, SmartWay boasts major clients and projects with Tabuk University in Saudi Arabia, national e-learning portal for Bahrain, and the Saudi Royal Air Defence amongst many others. As the Middle East continues digitizing education, the growth of the e-learning market sees major universities, government and large corporations with heavy investments seeking the services of online learning systems and providers. SmartWay provide professional IT and e-learning services across the Middle East, including training, customisation, technical support and hosting since 2001. As one of the first companies to provide Arabic support to open source LMS systems, they continue to grow with eight offices in the Middle East. Smartway provide professional support to Moodle through http://helpdesksmartway.com and also worked to spread the Moodle in Arab community through arabization Moodle documentations of the teacher and the student and the Admin in addition to the suponser Saudi moodle site sa-m.org that contains latest moodle solutions and provide free hosting and support services for researchers and students.